Funky Polkadot Giraffe: Baby Lock Rachel Sewing Machine Giveaway! Baby Lock Rachel Sewing Machine Giveaway! Today I’m over at Skip to My Lou as part of the Bake Craft Sew and Decorate series. 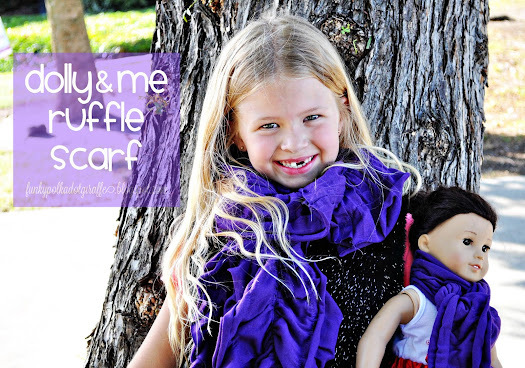 I am sharing a Dolly and Me Ruffled Scarf , these are quick to whip up for holiday gift giving. In fact, you won’t want to miss all the handmade gift ideas! This is one is sew AMAZING! She is a gem and her name is Rachel. 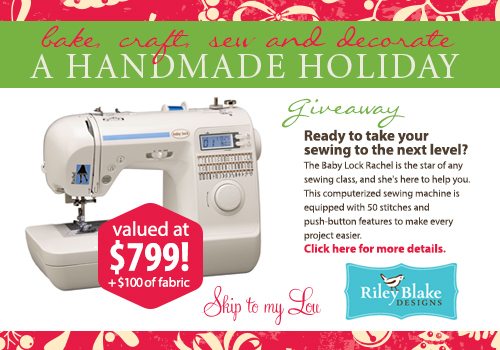 Baby Lock Sewing Machine ($799 Value) and $100 Worth of Fabric from Riley Blake Designs. Ready to take your sewing to the next level? The Baby Lock Rachel is the star of any sewing class, and she's here to help you. This computerized sewing machine is equipped with 50 stitches and push-button features to make every project easier. The value is $799. Click here for more details. Riley Blake Designs colorful fabrics include cottons, flannels, sparkle cottons, organic cotton, knits, dreamy, and laminates in a range of designer and basic prints. You will love this beautiful fabric. The best homemade gift I received was a flower picture from my grandson for mother's day.